We use many Google services daily and upload our person data on it. But what will happen to our data when we will stop using our Google Account. Yes, what will Google do with your data after your death? 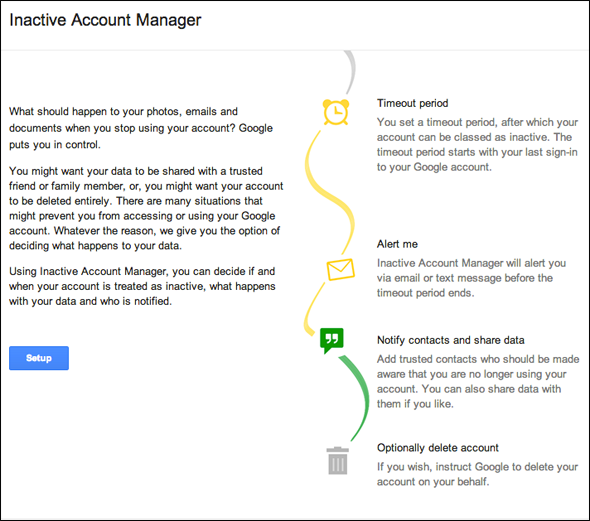 Now you can decide and tell Google with new Inactive Account manager. 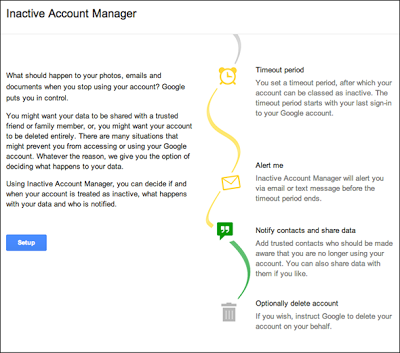 This new feature can help you to keep your data safe when you die.Google Inactive account manager allows users to set what to do with your data after your account is inactive for a certain period of time. If you will not use your Google account for that period of time, Google will do what you had decided. While setting up this feature, Google will ask you a time out period. Then it asks you an alternative email address and phone number Google will notify you on the given phone number and email addresses 1 month before the timeout expires. At this moment, you can only set 3 months, 6 months, 9 months and 1 year. You can also add up to 10 trusted friends and family members who should notify about this. In case you want to share your data with these contacts, you can select this option too. At last, If you wish to delete the data, Google will delete all data associated with your Google account after the timeout period expires. This also includes your publicly shared data like YouTube videos, Google+ posts or blogs on Blogger. “We hope that this new feature will enable you to plan your digital afterlife — in a way that protects your privacy and security — and make life easier for your loved ones after you’re gone,” Google posted. If you want to enable this feature, visit Google Inactive Account Manager.